PHOTOGRAPHS, a collection of thirty four black and white photos of WWI dogfights (17x10.5cm each), by Wesley David Archer (1898-1957), known as 'The Cockburn-Lange Hoax'. Mounted onto annotated display boards (64x51cm). 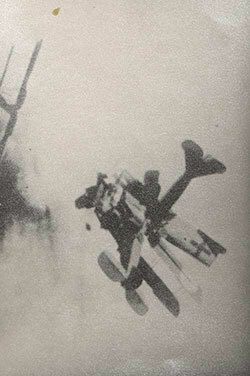 'Death in the Air: The War Dairy and Photographs of a Flying Corps Pilot' published in 1933, purported to be an anonymous WWI RAF pilot killed in combat. The manuscript, which included numerous spectacular shots of aerial combat, was presented to the publisher by a Mrs Gladys Cockburn-Lange, who claimed to be the widow of the British pilot. 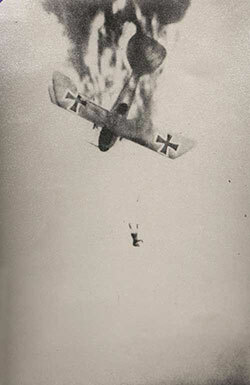 The photos attracted enormous interest, since there were very few images of WWI aerial combat in existence. The photos weren't definitively debunked until 1984 when archivists at the Smithsonian realised that 'Mrs Gladys Cockburn-Lange' was actually Betty Archer, wife of Wesley David Archer, a model maker in the film industry. Archer had created models of all the aircraft, and then had superimposed images of the planes onto aerial backgrounds. QUEEN VICTORIA SHOOTING MEDAL, c1880, in silver (38mm) by J.Fenwick, Birmingham, unnamed. Toned, uncirculated.